Responding to customer complaints and sliding ratings in quality surveys, Ford is making changes to its MyFord Touch infotainment system, including adding buttons. Autoblog writes, "The 2013 F-150 with MyFord Touch gives us a glimpse of what the new layout with buttons and knobs might look like, as Ford says a similar balance of touch screen capability and buttons/knobs are what's being planned for future models." In a press release, Ford says that, combined, its SYNC and MyFord Touch systems are sold on 79 percent of 2013 Ford vehicles. 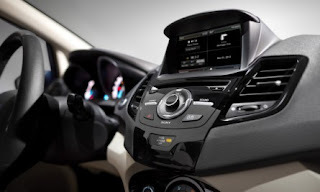 It says that's double the rate of sales of infotainment systems on Honda and Toyota vehicles. While sales of vehicles equipped with SYNC or MyFord Touch are strong, so are consumer reactions to the systems, which use voice commands, touch screens and capacitive controls. Automotive News reports that MyFord Touch "has hurt Ford's ratings in several quality surveys. Customers have complained the system is bulky, distracting and overly complicated to use. Ford has issued several software upgrades." Automotive News adds that in 2010, Ford was the highest-ranked non-luxury brand in J.D. Power & Associates’ annual Initial Quality Study. After MyFord Touch was launched, Ford dropped from a fifth-place overall ranking in 2010 to 23rd in 2011 and 32nd in 2012.